Happy Summer Everyone! Ok, well maybe not all of you are experiencing summer like I am (its already hot and tottie here!) but Happy Summer anyway. I know its been pretty silent around here. I've been pretty bogged down with other things and blogging got pushed to the side for a bit. The shop has been hopping (yay!) and I've been teaching quite a bit and crazy enough I've been sewing a crap load too. Just haven't had time to say much about it. Sometimes that's the way things get around here and that's good, but I start missing out on showing you fun techniques and sewing projects and all that jazz. In addition to all the craziness that's been going on around here, I decided to purchase a coverstitch machine. I've had my eye on procuring one for quite some time and I was finally able to treat myself to one and goodness gracious, let me tell you - I'm a convert. If you are unaware, this machine's main function is for hemming knitwear. It does that whole double needle thing with what looks like a serged edge on the other side. It does more than just hemming, but yes, this is the sole purpose for why I really wanted one. 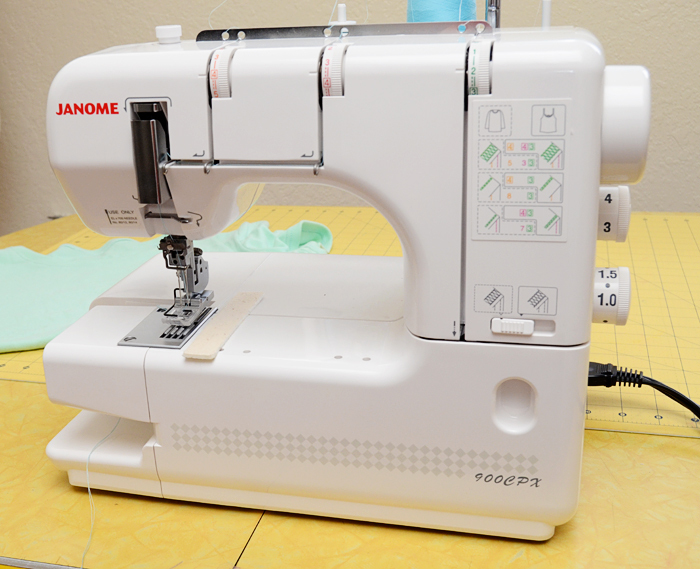 I had my eye on the Brother coverstitch machine and the Janome Coverpro. After reading Andrea's take on the Janome, I opted to go for this little machine. The free arm and "Wow, it actually looks like a sewing machine, look at all that room on the right hand side of the machine" thing is what finally sealed the deal. I purchased the lower end newer version of the one Andrea has (the 900CPX rather than the 1000CP) and I'm totally thrilled with it. Mine is only capable of a double needle function (the Janome 1000CP and CPX have a triple needle function, but after much thought I didn't really think this was something I would use) and I'm not able to move the needle for narrower or wider needle widths. I'm totally fine with this. I decided not to go into a full-on review of this machine since I think Andrea did a first rate job of that here and if you were ever interested in purchasing a coverstitch machine, you should definitely hop on over to her blog and have a gander at what she has to say. Like Andrea, I didn't want to spend a lot of money for one of the higher end models, but I still feel like I got a great deal for the money I did spend. Additionally, I would like to state that I think coverstitch machines are a good investment only if you a) work with knits quite a bit and b) are completely dissatisfied with the hemming methods that your sewing machine can do. The more and more that I've come to work with knits, the more and more dissatisfied I was becoming with the hemming methods that work around not having a coverstitch, ie: twin needle hemming (mine always tunnels something awful and I always end up breaking the bobbin thread when I put the garment on, uggh! ), blind hem stitching (one that I've become more attached to, but was still somewhat dissatisfied with) and finally self fabric or rib knit bands (my favorite of the three, but this method doesn't translate to every style very well). I think its also worth stating that this machine doesn't just magically work and not everything you do turns out perfectly. Like any other machine, it takes some getting used to and you'll still have to invest in a few extra pieces for it to be able to do certain things better. Also, there are sergers out there that have a coverstitch function. I thought about going this route too, but ultimately, I LOATHE entirely changing settings and feet and needle plates and blah blah blah on my serger as it is and would rather smother myself with a pillow just have a separate coverstitch machine - though I know that not everyone feels this way so just do your homework if you ever plan to invest in one (PS ~ from what I've read, coverstitch machines are MUCH easier to thread than sergers, my own coverstitch being a complete cinch to thread). Thoughts on coverstitch machines? Thoughts on hemming methods for knitwear? I am SO happy you posted this. I love working with knits (I can do wrap dresses in my sleep now) but I DREAD the hemming part. But I love the finished look. I tried with my serger but it still didn't quite give me the finished look that I want. From your photos above, I know I MUST get a coverstitch machine. I'm going to Andrea's blog now! Thanks for sharing this information! I've toyed with the idea of a coverstitch for a while now, but it is still an investment that is in "someday it would be nice" territory. Last night was the first night though that I wished I had a second sewing machine,so I wouldn't have to change out between my single needle and double needle! I have learned that with my machine, in order to have a nice double needle stitch, the bobbin tension needs to be loosened, which involves taking apart the bobbin case. Not hard, but a pain when having to switch between the two 3 times for a t-shirt, especially since it involves using tools. I don't know if that would be an easier process on a newer machine, but I will definitely be doing a little research! Thanks! I was afraid of sewing knits, but I'm really enjoying it now, after a few tries. 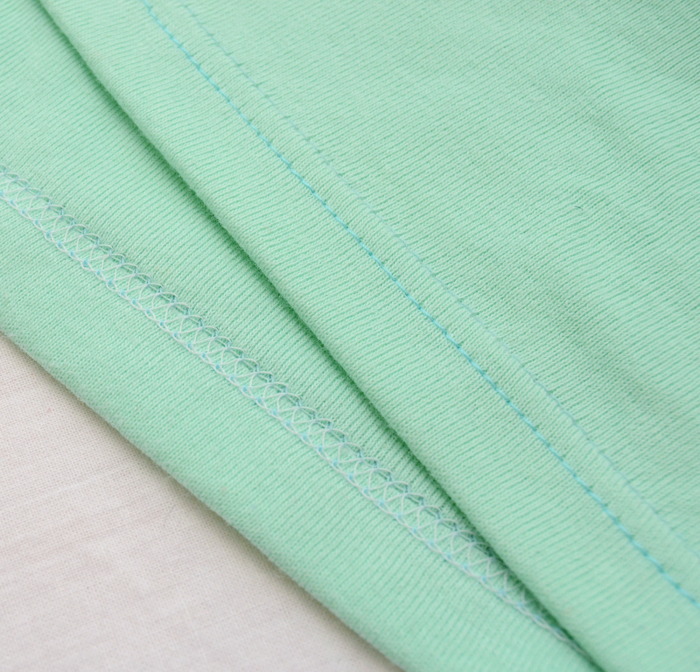 The double needle hem seems to work ok for me, although you still need to trim the fabric closely afterwards. This post on the coverstitch machine is quite useful. I'm keeping it in mind for a potential future purchase. Thanks! Joelle, if you're going to do this often, it might be easier to purchase and extra bobbin case that is exclusively for your knit projects, set at exactly the tension you want it. It would make the process much easier! I also bought a coverstitch not too long ago, for exactly the same reasons. You listed them exactly! I'm still learning to use it well, but I know it will be fantastic for all the knits I like to sew. I REALLY want a serger with a coverstitch function (because I can't afford both right now). However, I would definitely love to have one of each. :) It just looks sooo beautifully finished, and yes I live in knits! Yea! Glad you took the plunge as well. I think the Janome coverstitch is a worthy addition to the sewing room, and makes me feel more confident in what I decide to sew and more proud of the end result. Enjoy it! I also love my coverstitch machine as I often sew knits. Yay! Having the right tools for the job is half the battle - maybe more! I've been eyeing coverstitch machines ever since I bought my serger a few years ago and was planning on buying one soon. My serger is a babylock eclipse with jet air threading and I looove it, it has given me no problems whatesoever, but I'm having a hard time deciding what brand of coverstitch machine I want. I look forward to hearing more about how this machine works for you! Lucky you! Is it Christmas time? Christmas in June, well, May actually. Ha! Thanks for the opinion about buying a separate coverstitch machine (rather than a serger that can coverstitch). I don't need either machines right now (I'm sewing mostly bras and undies) but if I ever do, that will be a handy tip. can't wait until i can get my grubby little mitts on one of these! enjoy! Love, love, love my coverstitch. I've had one about 4 years now and you'd have to pry it out of my cold dead hands to get it away from me! I am still trying to get brave enough to get a serger. But the stitching on that looks fantastic! I don't have a serger, and that's one of the major items I'd like to buy in the close future. The regular machine I have does a terrible work with knits, so I have no experience sewing them, but I'd love to change that. However, if I start sewing knits with a serger, I'll need either a new sewing machine, or a coverstitch machine to complete the knit garments, and it sounds like a lot of machinery to buy at once. So far, I've opted to avoid knits completely, this being a solely reason. Oooh, I am so jealous! This is definitely something on my splurge list. I've head some horror stories about coverstitch machines, so it's nice to hear positive reviews and tried and true success. Oooh, what a fun new toy! 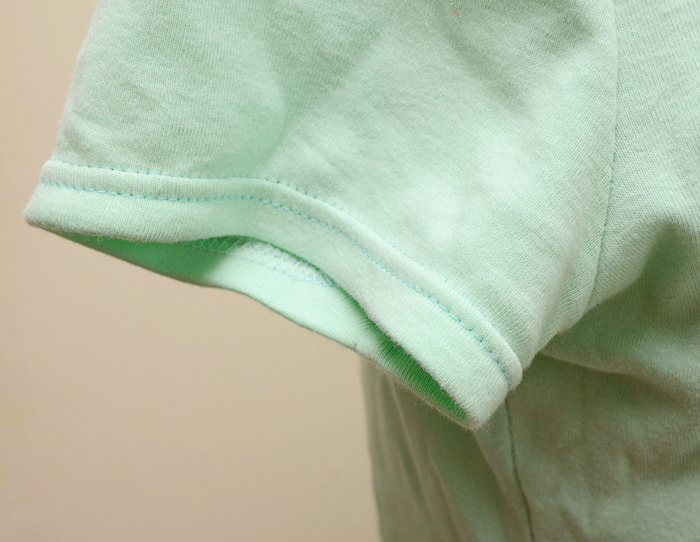 I LOOOOVE sewing with knits, and I recently posted some different methods that I use to hem knits. Have you tried wooly nylon thread in the bobbin with a walking foot? I highly recommend it! So. I was just reading your blog, and I thought, "She looks really familiar." Then I thought, "Oh yeah, she teaches that zipper class." THEN I realized, "Hey, she is local!" And finally, I remembered that you cut my fabric for me recently at Yellow Bird. It is such a small world!! That same day, I met someone in the shop whose blog I had been following, and I had no idea until later that evening when I was reading some of her posts. Sewing brings us all together, huh?! Great timing on your post. I was just about to order one yesterday and got a bit scared. I'm off to press the button now. Many thanks! Interesting to read your thoughts on knit hemming. I'm pretty happy with the results I get with a twin needle on my normal machine. But I sometimes wonder if I have low standards with my finishes! Ahhhhh!!! I'm so excited for you. Those photos are gorgeous - what a cool machine. A coverstitch is way up there on my wishlist. I love working with knits and wear them daily, but am also completely dissatisfied with twin needles. If it's thicker fabric I can get the hems to look ok, but light cotton or rayon? No way. It's a mess. Oh boy, now I'm obsessed with getting a coverstitch machine! I can totally justify needing it in order to provide super professional looking finishes to my clients' precious knits...Right???? I'm interested to see how you progress with this machine as you own it longer. Does it do well with small spaces, i.e. sleeve hems, etc? Thank you for sharing your new toy!